The extraordinary demand for precious metals coins following the 2008 global financial crisis caught the minting industry by surprise, resulting in never before seen coin rationing and shortages. It seems not much has changed, with recent reports that the UK Royal Mint ran out of 2014 Sovereign gold coins due to "exceptional demand", as well as the continuation for over one year of an allocation program first put into place early 2013 by the US Mint on its ever popular silver Eagle bullion coins. While these recent events have been limited to specific coins, with availability of other leading bullion coins like the Perth Mint’s gold Kangaroo not affected, it does seem to indicate that worldwide minting production capacity is still unable to meet demand surges. I have been talking about this issue for some time, as in this July 2012 interview and here. The 2008 global financial crisis did result in private and public mints expanding their production capacity. The Perth Mint, for example, has spent over $50m since 2008 on improvements to existing machinery as well as new and expanded facilities. However, it is little appreciated that the bottleneck in the global coin minting process is blank (planchet) manufacture. This is a far more complex process than simple stamping of a coin, particularly around purity and accurate weight control. As a result, blank manufacture is a process that benefits from economies of scale and thus few mints these days make their own blanks, outsourcing the process to a limited number of private and public suppliers, of which the Perth Mint is one. If you dig deep, you will find that many of the coin supply problems come from underestimation of demand and the resulting exhausting of blank inventories. Often, blank suppliers are mints themselves and can face conflicts where they earn more by prioritising blanks for internal use rather than supply externally. Running higher blank inventories is often not an option, due to the cost of funding the high dollar value of the inventory. 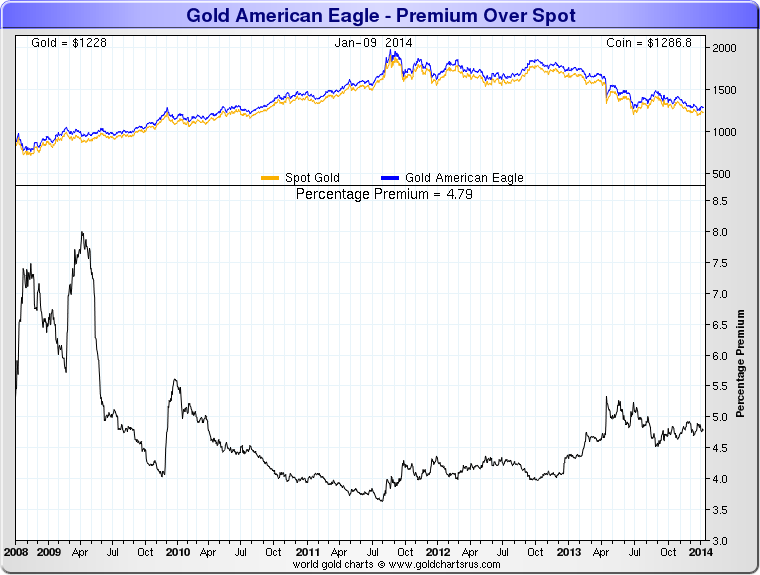 The 2008 premiums were celebrated by some at that time as a proof of a physical-paper price disconnect and a "good thing". The fact is that there was plenty of supply of the raw gold or silver (the Perth Mint at one stage was shipping in 20 tonnes of silver each week for weeks on end from London with no problems). High premiums are actually not a good thing, because it means that the same money buys (and takes off the market) less ounces. Notwithstanding the capacity expansion by blank suppliers over the past five years, in my opinion there is no way the industry can meet the demand that would occur were precious metals to see even a small bit of interest from the mass market. While cast bars are a lot easier to make and refiners have much more casting production capacity, I am not even sure if it could meet sustained mass market demand. For now 2008 style shortages and rationing don't seem to be on the horizon but the fact that the UK and US Mint are having supply issues on a few of their product with metal prices at these low levels is an idicator that as prices rise and (re)attract investor interest, shortages and rationing may become a reality of coin buying life again. "Running higher blank inventories is often not an option, due to the cost of funding the high dollar value of the inventory." I'm not familiar with the other blank producers, but if Perth Mint or another supplier wanted to keep a higher inventory of blanks couldn't they fund it through introduction or expansion of unallocated pool accounts? What about 1kg 9999 (LBMA) bullion bars? Can those also be subject of potential shortage towards the retail market? I have been reviewing your links and doing some searches of my own on the topic of Comex cover ratios etc. As you know I have been working on a theory that the changes in margin, cover and other stats could be explained by viewing the bullion banks Comex operations with a banking model mindset. I think it's time for me to put together a post and seek input from some of the wiser heads. Here's one reason why I think it's time to explore this. In discussing the Comex deliveries many commentators tend not to place much emphasis on the delivery aspect of the exchange operations because it's usually around only small single digit percentage of the total contracts. However it you think of the registered gold as being akin to the cash in a bank demand deposit then the figures take on a much greater significance. Typically there is only a few days supply of cash in the banking system. Physical gold and physical cash are analogous in these two systems. Both systems are at least theoretically subject to bank runs and default. There are liquidity and solvency risks here that need to be managed. "The highest peak of delivery at COMEX was back in 2006, when the ratio was nearly 11%. Since then other peaks seen have been around half of this. Since the beginning of the year the ratio of those taking delivery against open interest contracts has been declining. So far this year the percentage of those taking delivery has been between 2-3%, small compared to peaks seen in June 2006 and more recently, December 2011. This would suggest, therefore that the drawdown of gold stocks and the fall in cover ratio is not the problem some have suggested it is." Okay the drawdown and cover ratio may be no big deal but as we can see in that graph the demand for the cash equivalent (physical gold) in this Comex system ranges from less than 1 per cent to 11 per cent. Imagine that you are a bank with enough cash on hand to pay 1% of your depositors account balances and depositors representing 11% per cent of the deposits show up demanding cash - hello Northern Rock? Regardless of how remote this possibility is I think we can assume that the BBs manage risk in this area of their operations and there should be some tracks we can follow. Yes they could, but the limiting factors are 1) you would be an unsecured creditor which many investors would be wary of for private companies, hence harder to raise a significant amount of unallocated 2) not helped by one eyed people who can't distinguish between "good" unallocated (used for inventory funding) and "bad"unallocated (used to short, which is counter to investor's interests), which creates fear against all unallocateds. 1kg is not really "retail" but I would be surprised of any shortage of these as refiners are geared up to make these and 400oz bars as their most common product. Small sized cast bars, possibly, as a refiner who can make 10 tonnes of kg bars a week really only has the capacity to cast 10,000 bars. If the demand was for 10oz bars, then that is only 100,000oz, or say 3 tonnes of throughput, compared to 10 tonnes of throughput of kg bars. Good points, but BBs may hold additional "cash" in other locations. For some tracks see the post I did regarding TF's observation of kg bars being deposited into Comex. I think we must consider that a BB would know that historically Comex deliveries can peak at 11% and would plan accordingly. Then again, they may well be under financing pressure and reduce stocks. Hard to know. costata - longs don't demand delivery on the COMEX. every single short contract must either be covered or delivered (or closed out via EFP/etc). What i mean to say is that the shorts don't wake up on first notice day and say "oh crap - surprise - all of these longs are standing for delivery!" every short who doesn't cover is "standing for delivery"
I was wondering if I might not get physical in case the price drops further. I might want to buy some more at $1100. Can a private person walk into PerthMint with some paper and take a 400oz sucker out? Jim Rickards view on German gold, expressed some months ago (video interview), was that Germany did not want to get their gold back, but did it to silence some of the locals. They are in bed with the FedReserve. Not sure why more commentators are not aware of this, or maybe they prefer to ignore it. Some refineries do not deal with the public. You can always buy 1kg bar from us but 400oz you can only get via Perth Mint Depository (it is not exactly retail sized product). Perth Mint will always prioritise its refinery output to retail individuals as more profit there than selling wholesale to BBs. The reason commentators are not talking about this is because it means they can run with these two more one-eyed memes: delay was because Fed doesn't have Germany's gold or that Germany doesn't trust the Fed. I will need to do a piece on Germany. ...every short who doesn't cover is "standing for delivery"
Thanks for clarifying this. I also understand that the parties taking delivery won't be a surprise to the BBs in most cases. In another discussion a while back Bron commented that the changes in margin requirements were not easy to explain. Obviously this is part of the exchange's risk management strategy. How does this operate in the exchange members interests? Is there any correlation between the total amount of margin posted by clients of Comex members and the dollar value of registered gold? Are there any TA indicators that predicted an increase or decrease in the number of clients standing for delivery? Off Topic - I tweeted a link to this article (http://www.bloomberg.com/news/2014-01-09/how-the-big-guns-are-playing-gold-mining-stocks.html)discussing the strategies being used to to profit from the "valuation gap" between gold mining stocks & ETFs + physical gold. It’s easy to chalk up the funds' growth to the contrarian kookiness of gold bugs. The truth is more complicated. Institutional investors see unusual opportunities in gold mining stocks. Some figure the gap between the prices of gold bullion and mining stocks is so wide that they can make profitable bets on that valuation gap narrowing. Others see improvements in management and operations of miners. A third group likes mining stocks simply because they hope to profit from the stocks' volatility. At the end of my most recent comment to KD I posted a link. If what the author of that story is saying is correct it may explain the dramatic difference in the behaviour of GLD investors versus SLV last year. I realise that there was a lot more institutional money in GLD but the sell off in SLV was hugely disproportionate if GLD is taken as the guide to the institutional investors response to the collapse in the price of gold and silver. Perhaps it isn't possible for very large investors to construct the kind of trades in silver mining stocks that they can structure in gold stocks. I'm thinking that a lack of depth in the market could be part of the problem because so much silver comes out of mixed ore bodies. The retail component holding on in SLV is easily explained as nominal loss aversion. But the discrepancies in the institutional response to these supposedly comparable precious metal ETFs demands an explanation IMHO. Margin would be related to open interest, as every holder of a future needs to post margin. Given registered stocks are always lower than OI, but that margin is only a % of value of future, there may be some equivalence between total cash margin in the system and registered stocks. Depends on the % ratios of each. Eg if registered is 10% of OI, and margin is 10% of futures, then you have 100%, cash held = registered. I agree that there is no way the silver market or silver equities are large/liquid enough to support that sort of trade on any scale, hence why I think we don't see so much institutional playing in silver. but I have no data on that. Thanks for the responses. I'm going to do some further investigating and try to determine if there are any correlations in the numbers on margin, open interest, the cost of the registered gold stock and so on. If I come up with anything interesting I'll post about it. People often read and misread what they want into article. Regarding margin, isome instances the exchange will let you post registered warrants as collateral against your margin calls. Useful if you are a player in the delivery game.